Look at the park to get a reference to Disneyland, and that Al would not include that in his game. Look at the park to get a reference to Space Quest and Coarsegold. Look at the alley for a reference to the dark alley in Leisure Suit Larry 1 where Larry got mugged. The name Raguka Singh Soong could be a reference to Sierra producer Guruka Singh Khalsa. Try to buy condoms in the store for a reference to Leisure Suit Larry 1. Unreversal Studios is a reference to Universal Studios. 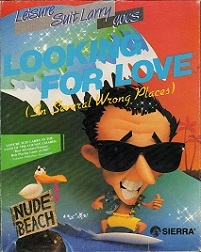 If Larry doesn't wear the wig after leaving the ship, the death sequence mentions Sunnyside Soft, which was Al Lowe's own game development company before he joined Sierra. In the airplane, look watch for a reference to Leisure Suit Larry 1. Smell the smoke in the smoking compartment for a reference to Leisure Suit Larry 1. Anywhere in the game, set the filth level in the menubar to zero for a reference to Mother Goose. At the end of the game Polyester Patti introduces herself as a new protagonist for Leisure Suit Larry 3.